Esholt01274 433678work VillageExplore Esholt a pretty village on the outskirts of Shipley. In the nearby woods; Sping wood, Belmont wood, Jerrison wood and Sodhall Hill, you will find footpaths and mountain bike trails. Highlights include pretty bluebells in the spring and a path along the Guiseley Beck in the eastern end of the woods, a pleasant place to walk. The River Aire and the Leeds and Liverpool Canal run just south of the woods so you could pick up the walking and cycling trails along these waterways. Every year Esholt village attracts crowds of Emmerdale fans from both the UK and overseas. The village was chosen as the backdrop for Emmerdale Farm in 1977 and filming took place in Esholt for more than 20 years. Visitors can take a stroll around the area and see some of the more famous landmarks such as the church, post office, tea rooms, playground and Zoe Tate’s vet! Stop to have a drink in the most famous working pub in the UK ‘the Woolpack’, hosted by numerous landlords including Amos, Mr Wilkes and Alan Turner. Today it is the only ‘soap’ pub where you can get a drink. As the show became more popular with episodes airing every day, it became difficult to continue filming in the village. However, with Ashley Thomas’ dementia award winning storyline the production team returned to film in the village and the Woolpack in 2016. On your visit to Bradford and District make sure to take a trip around this stunning village. 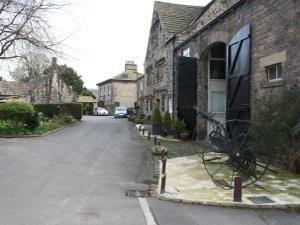 Extend you stay - Nearby you will also find Baildon Moor which has miles of cycling and walking trails. It also commands great views of Bradford and Leeds from its elevated position. Explore Esholt a pretty village on the outskirts of Shipley. In the nearby woods; Sping wood, Belmont wood, Jerrison wood and Sodhall Hill, you will find footpaths and mountain bike trails. Highlights include pretty bluebells in the spring and a path along the Guiseley Beck in the eastern end of the woods, a pleasant place to walk. The River Aire and the Leeds and Liverpool Canal run just south of the woods so you could pick up the walking and cycling trails along these waterways.